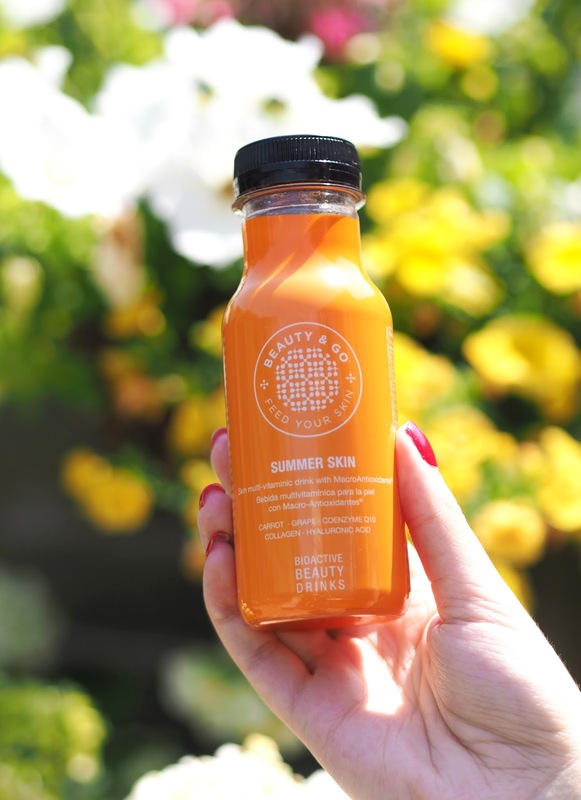 Recently I've been detoxing my skin for the Summer with these fruity beauty drinks by Beauty & Go. You've probably all heard the buzz around these kind of beauty drinks lately but do they actually do anything to improve your skin? As always I was intrigued to find out for myself! I'm obsessed my skincare products and get really excited when I find new things to try out but instead of focusing just topically beauty drinks are all about benefiting your skin from within. I love fruit juice, smoothies and already do some juicing so it was really up my street. Beauty and Go are a brand that I hadn't come across before but once seeing their variety of drinks and reading about their philosophy I was really pumped to give them a go! They are beauty company who are passionate about nutrition and feeding your skin from within along with investing research into new innovative technologies. "For us, skin goes deep. We don’t just work on the surface of things. We nourish and protect where others can’t reach. We use science to empower nature and deliver what your skin needs from the inside out." They offer different varieties & flavours of their drinks depending on your skin needs. 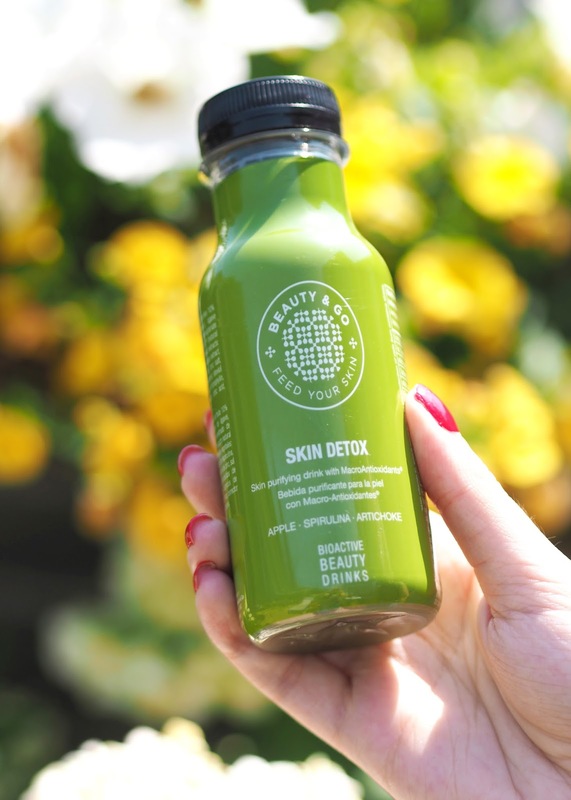 All packed with vitamins, minerals and MACRO-antioxidants to supercharge your skin and boost hydration from within. I have received the Skin Detox* and their Limited Edition Summer Skin* drinks. You buy them in 7 day packs and it's recommended that you drink one bottle each day for best results. However if you want to go all out on the regime perhaps for a special occasion you can get 30 day treatment packs as well as 60 day treatment packs. "We would rather feed your skin than feed the sceptics. We don’t beg for approval, we think differently and we are prepared to break the conventional rules of beauty. We don’t do what you are supposed to. We play around, dare to explore and set our own path. And we have the patents to prove it. Backed by science, we defy the doubters. We believe that true beauty comes from within. And we dedicate ourselves to unleashing the beauty, in all of us, that has yet to be seen." Skin Detox | This one is designed to purify, stimulate digestion & eliminate toxins so perfect if you have breakout or acne prone skin. It contains apple, spirulina algae, zinc and artichoke. Although I'm used to a bit of green juicing I must say it's still a slightly acquired taste. For me it's does taste like it's really 'good for you' but the apple in it makes it palatable and I felt like this was a great one to kick start my beauty drink regime. There is no optimum time to drink these drinks as the active ingredients work at any time of day. So you can drink it at breakfast time or take it on the go to sip throughout the day! For best results, drink one bottle daily. • Contains 50% of your daily vitamins & minerals. • Less than 80 calories per bottle. • 74% of volunteers felt a noticeable improvement in the appearance of their skin. • No added refined sugar, sweetened with stevia leaf. • No artificial colours or preservatives. Summer Skin | This one is designed to prepare your skin for the Summer by helping to increase your body’s ability to withstand UV damage so that you can acquire a deep, natural tan. This one contains apple, grape, mango, lychee, lemon and carrot purée and is so very tasty! This was definitely my favourite of the two in terms of flavour, it felt very tropical and summery. As with all their drinks they recommend drinking one bottle daily for best results. Start Summer Skin 1 – 2 weeks before the arrival of summer and continue after sun exposure to restore your skin and repair tissues. It also claims to fight damage caused by free radicals through sun exposure and rehydrates skin and extends your tan - amazing! Note: this is not intended as a substitute for SPF protection so always use a goo quality sun cream. • V5 Multivitamin Complex: An extraordinary combination of vitamins (Vitamins A, C, E, B6 and B12), that work from within to keep your body and skin in good shape plus healthy and smooth over a longer period of time. This vitamin complex significantly boosts the effect of the MACRO-antioxidants. • B-Carotenes: Provide around 50% of the Vitamin A required in our diets. • Zinc: A mineral that contributes to maintaining our skin and protecting our cells against oxidative damage. • Coenzyme Q10: A powerful antioxidant that contributes to neutralising the harmful effects of free radicals, one of the primary causes of skin ageing. It has anti-inflammatory properties that give skin an extra benefit after sun exposure. The level of Coenzyme Q10 in your body inevitably diminishes over the years, making direct consumption of this supplement all the more important. • Green tea, aloe vera and chamomile: A highly soothing, relaxing and anti-inflammatory cocktail, perfect for repairing skin after sun exposure & protect against UV radiation. • Collagen and Hyaluronic Acid: Prevent water loss, dehydration and loss of elasticity, giving your skin a soft, firm, luminous appearance. Collagen also strengthens your bones, fingernails, hair and joints. "There may not be an elixir of youth. But if antioxidants are the superheroes of skincare, then MACRO-antioxidants® are the Gods." 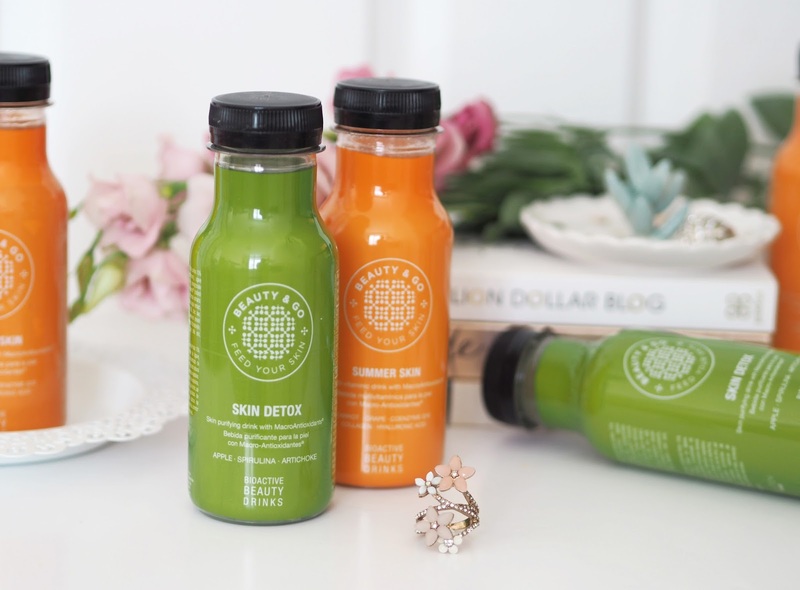 Verdict | I really enjoyed trying out these drinks as they tasted great and it was really interesting learning about how the skin specific vitamins and minerals help your skin! I think when you're making juices yourself you don't really know exactly which vitamins etc. you are getting. I suffer from hormonal break outs and scarring from previously having very bad acne. I tried each type of drink for just 7 days and although I didn't find that it stopped my hormonal breakouts unfortunately my skin definitely both looked and felt more plump and glowy! I am thinking of ordering another pack just to see if drinking one of these a day for a whole month+ has an effect on my breakouts and scarring. I have my eye on the Skin Brilliance illuminating one and also the Skin Vitality which is anti-fatigue. Skin cells have a 4-6 week cell cycle so it could take that long to see the full benefits. Either way I'm very happy to see a good little boost of hydration and glow to my skin! I think if you're someone who's been thinking about taking some vitamins or supplements to help improve their skin but are unsure which ones will target your needs then this is a very good option to try. Use them in conjunction with a good skincare regime and healthy diet to get the best results. Let me know in the comments what your thoughts on beauty drinks are. Have you tried any yet? If not would you consider giving them a go? *This post contains PR samples however all opinions as always are my own, please see my Disclaimer for details. Product information and quotes taken from the Beauty & Go website.